Our 3.5 months in South America have been basically planned around one central activity – doing the famous Inca Trek to Machu Picchu. Ever since he was little, my partner Joel has been fascinated by the ancient South American Inca civilisation. 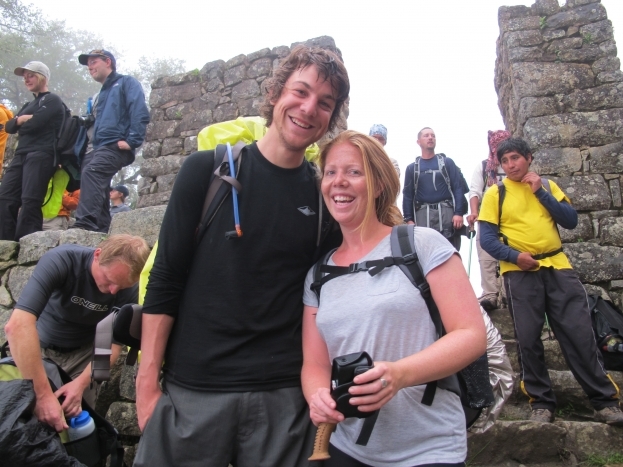 He’d been dreaming of doing the Inca trek for years so we made it the cornerstone of our South American adventure. For those of you whose ancient history knowledge is a bit sketchy (like me), the Incas ruled much of South America from the 1200s to 1500s. They were a remarkable civilisation with strong culture and religion. But despite their strength and numbers, they were thwarted by the Spanish pretty soon after they invaded. 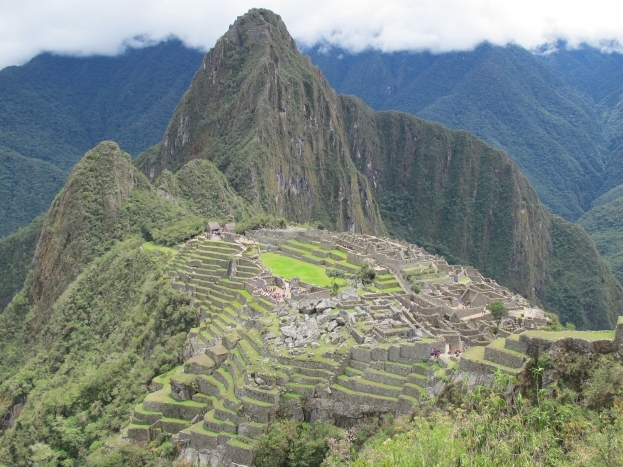 Machu Picchu is the best surviving example of Inca architecture. It’s perched atop a steep, rocky mountain and could be reached by two main walking tracks. The trade route, which the Incas used to transport goods on the backs of llamas and alpacas, winds through the valley to reach the city in one day. They built a second 44km path that winds up and down mountains, travelling from an altitude of 2600m above sea level to 4200m. The Incas worshipped Pachumama (mother earth) and by walking along this picturesque path, they believed they were closer to their deity. When they realised the Spanish were coming, they destroyed the first part of the path so the Spanish never realised the city existed. It remained the secret of the local communities until American historian Hiram Bingham came to the area in 1911. 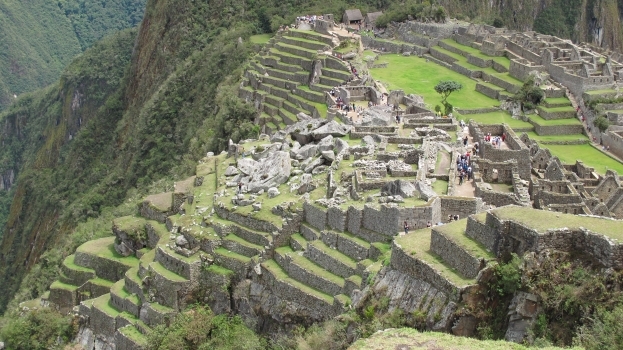 Every day hundreds of tourists visit the ancient Machu Picchu ruins. The bulk of people catch a train to the nearby town of Aguas Callientes, then jump on a bus up the mountain for a morning walking around the site. Those who are a tad more gung-ho (or crazy) opt to hike the 44km like the Incas did to beat the hoards of tourists for a glimpse of the hidden city at sunrise. Our alarm screeched at 4.45am on the morning the trek began and soon after we climbed aboard the bus that would drive us to the start of the trek. I was feeling pretty nervous at this stage – adjectives such as “gruelling” have been used to describe the trek and after three months of travel, I wasn’t confident that my fitness levels were up to such a challenge. Luckily the first day was pretty cruisy. 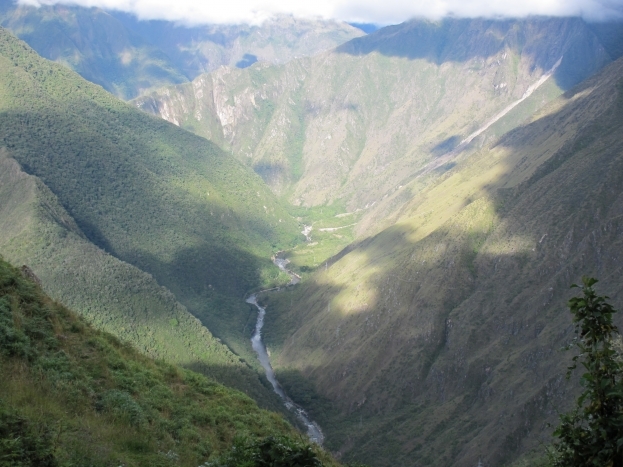 We walked 12km of what our guide David referred to as “Inca flats”, which are relatively small up and down hill sections. The heart rate still got going, but we had made it to our camping spot by 4pm for a well-deserved cup of coca tea, which is said to give you energy and help with the affects of altitude. 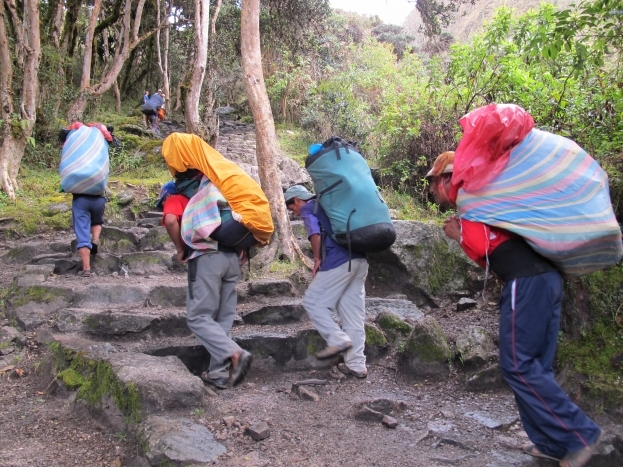 As we trudged along the stone trail, “chaskis” (porters) carrying all our gear would race past us. These guys are sub-human – for our 14-person group, we had 22 chaskis to carry our tents, food and gear. 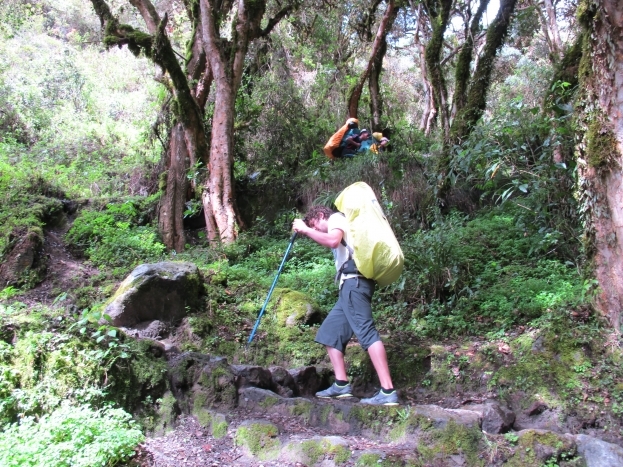 Wearing only sandles or worn-out sneakers, the chaskis would run along the path, lugging the heavy supplies and have our camps completely set up by the time we arrived a few hours after them. They’d all stand and clap as we arrived, which felt a little odd considering how much more impressive their performance had been. Considering every supply had to be carried, we assumed the food would be pretty basic. Incorrect. The incredible chef Apu served up three courses for lunch and dinner, which included hearty soups, delicious stirfries, fried trout and all sorts of other Peruvian classics. On the first night, our guide David warned us that day two would be the big test. We had to climb steep steps uphill for about three hours, then spend another two hours climbing back down. The uphill part was torturous, but the downhill steps were often just as hard, quickly turning your legs to jelly. 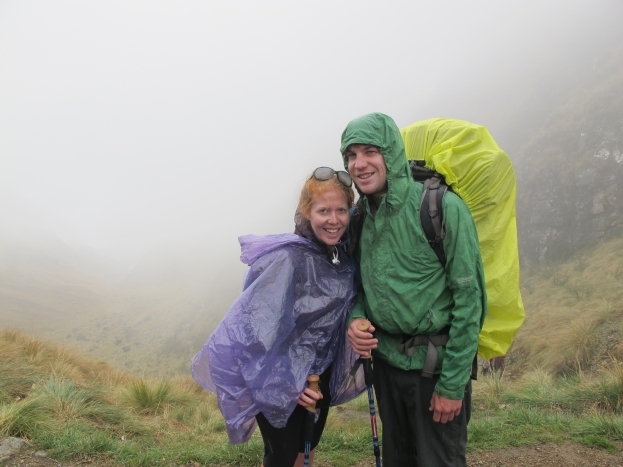 While it would have been nice to pause at the top (called Dead Woman’s Pass) to take in the view and bask in the glory of making it up a gruelling mountain, the weather was so miserable that we just kept walking, hoping it would warm up as we descended out of the clouds. Joel and I surprised ourselves by how well we handled the so-called torture day. A few months of partying, and a serious lack of hiking gear, had us expecting to be trailing the group the whole time. But it seems the fact we’d spent a few weeks at altitude had helped our bodies adjust and we were able to maintain a spot near the front guide all day. Guides David and Manuel with myself and Joel after a rainy afternoon of hiking. Day three was the highlight of the actual hike. 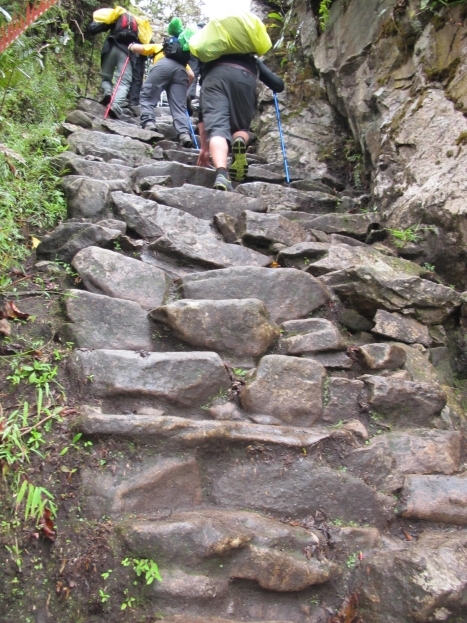 We covered 15km – the first couple of hours were steep uphill, but the bulk of the afternoon was down, passing amazing scenery and several Inca ruins along the way. We camped 5km from Macchu Picchu so we would be well positioned for a 3.40am wake-up call and walk to the entry gate. Hundreds of other hikers were camped at the same ground, so we had to try beat them to the starting gate where we would wait until 5am for it to open and let us high-tail for the ultimate view of the ruins. We were pretty disapointed to discover it was pouring with rain when we woke up, but we donned our ponchos and put on a bright face – our guide insisted smiles and laughter would bring the sun. 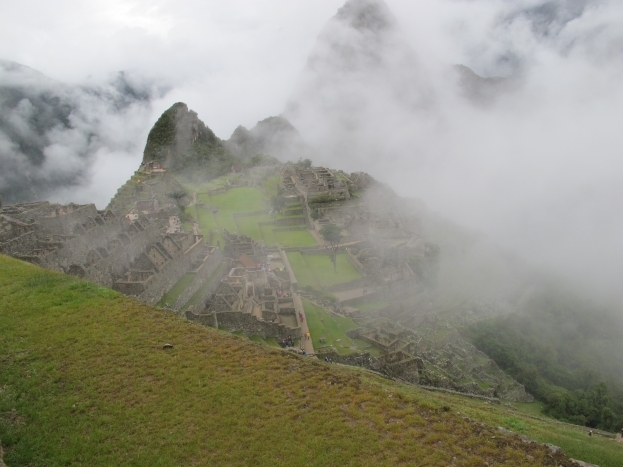 The clouds were heavy when we arrived at the postcard viewing area and for a while it seemed we would have to use our imagination when looking across at where Machu Picchu lies. But just as we were about to walk into the heart of the ancient city, the clouds parted for an eerie, magical view. It certainly lived up to expectations. The ancient city is in near-perfect condition, perched atop the steepest cliffsides you can imagine. Photos don’t do the place justice – you have to see it to comprehend the engineering feat of building a city on such terrain without the use of modern technology. We ended up buying tickets to return to the ruins the next day when the sun was shining. We sat atop one of the retaining walls and spent the day marvelling at the magnifence of the”lost city”.